Its another debut on on Live and Loud! 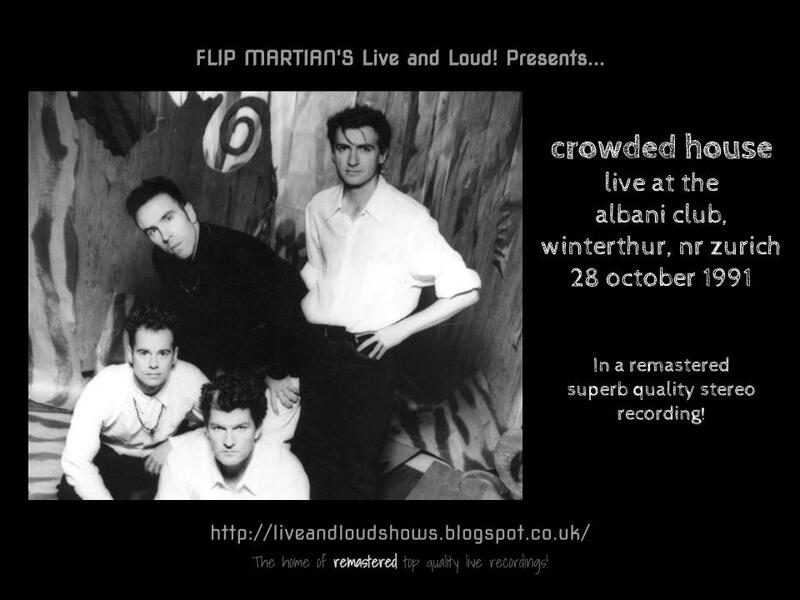 this time - for Crowded House, a band requested by 1 of my listeners. I originally found a gig from 1986 - a really interesting listen as its from so early in their band history. I couldn't do anything with that one to repair it unfortunately as the recording levels were slightly too high - which means distortion appears throughout. Not lots of it - the gig is still listenable, especially if you're a fan of the band; but distortion is the one thing I can't remove - once its there, its there. And I like Live and Loud! gigs to be as blemish free as possible, once I've finished with them! So I went in search of another and found this gig from 1991. Tim Finn, Neil’s brother of course, joined Crowded House for the recording of Woodface, their 3rd album, and initially for the tour in 1991 which followed. At some point they realised they had contrasting styles and were probably better not continuing together, so before they fell out, they agreed he would leave the tour during the UK leg in early November, just before the band were due to go on stage in Scotland. The recording we have here was taken a few days before that, so is one of the last gigs with Tim Finn featuring in the lineup. This was originally a good clear stereo recording (if a little flat) I guess from Swiss FM radio but with some sensitive EQing and gentle remastering, its really brought the recording back to life and sounds really great. The show is now available for free download HERE as 1 MP3 file. Or, if you would like to have separate tagged MP3s, or even lossless files in FLAC format, head on over to the Donations tab to see how you can obtain these for a very small donation towards the site costs. Congratulations on reading this far in the blog - if you have, you will now be rewarded! Remember that 1986 recording I said I couldn't use for this series? Well, you can still have it for absolutely free - unremastered, just as I found it in a hidden corner of the internet, right HERE. Its worth it just for the banter on stage. For a setlist check out the excellent (but not always 100% accurate) Setlist FM website if you want to go looking for it. You don't want to go looking for it? Ok then - the page is right here... ;-) Enjoy this as a little extra bonus. Many thanks for both shows Flip, much appreciated. No worries - hope you enjoyed them. The horns on "Mean to Me" are so crisp...whole show a joy!!! Thank you!!! Thanks, glad you enjoyed this one. Check the site for Split Enz and a new Crowded House gig going up later today!